How to get the Record when Double-Clicked on the Row? 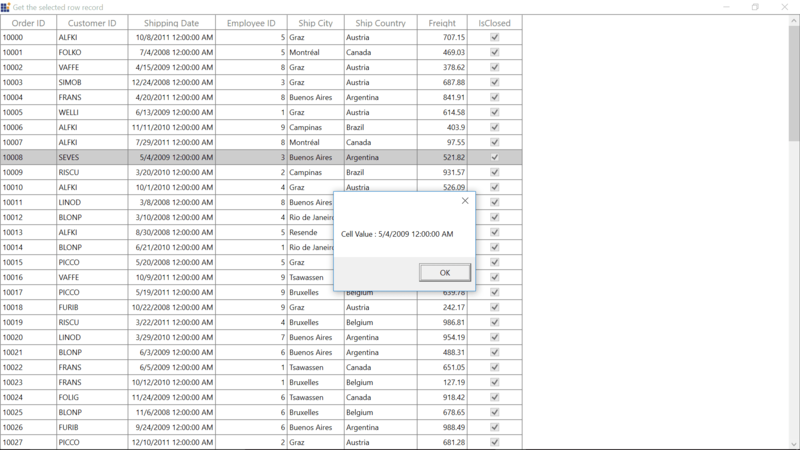 In SfDataGrid, you can get the record based on row and column index from mouse pointer position. The record can be accessed by using any mouse events (example MouseDoubleClick event). This event is triggered when you double click on the row. Within this event, you can access the Visual Container by using the GetVisualContainer() extension method that exists in the Syncfusion.UI.Xaml.Grid.Helpers. The ResolveToRecordIndex is resolved by using current RowIndex and you can get the record index. From record index, you can get the record from dataGrid.View. Refer the following code to get the record of the row while double click on row. Refer the following screenshot to get the record from mouse pointer position. var recordentry = MainDataGrid.View.GroupDescriptions.Count == 0 ?